You are here: Home / Media / Wanted: 300 South Aussie dads-to-be! The SA Mental Health Commission wants 300 expectant dads from across South Australia to sign up for its innovative pilot project SMS4dadsSA. Recruitment is now underway for the free project which will provide expectant and new dads with information, support and connections via online services through their mobile phones. SA Mental Health Commissioner Chris Burns said that being a dad can be the best – and most challenging – experience of your life. “Research shows that a dad’s bond with his baby is vitally important for the development of their child’s brain and emotional wellbeing,” he said. The Commission is partnering with the Family Action Centre at the University of Newcastle to bring the SMS project to South Australia. “The outcomes for SMS4dads in NSW were very positive with 92% of dads saying the program helped them in their transition to fatherhood and 83% saying the program helped them with their relationship with their partner,” Commissioner Burns said. Now, expectant dads from metropolitan and country South Australia can be part of SMS4dadsSA and transition to parenthood with the help of information and support delivered in an innovative way from a trusted source. If your partner will be at least 20 weeks’ pregnant in March 2018 and you are interested in being part of the project, you are encouraged to register your interest at https://samentalhealthcommission.com.au. To participate in the program, you will need to be over 18 years old and have a mobile phone capable of receiving and sending text messages. If you know an expectant dad, encourage them to sign up! 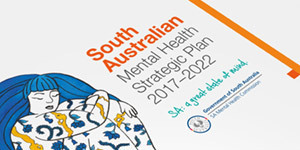 The SA Mental Health Commission will be in touch with eligible expectant fathers in March with the next steps on involvement in the project. Text messages with tips, information and links to other services help Dads understand and connect with their baby and support their partner. A three weekly check-in text to see how Dads are travelling and if they find they’re struggling linking them to specialist assistance. For further information, please contact Joan Atkinson on 0422 916 496 or joan.atkinson@sa.gov.au.